Cruising with the family is one of the best ways to enjoy a vacation since it allows you to see several destinations, enjoy countless activities and eat a variety of international dishes without having to plan every detail of it. Still, preparing your family for a cruise requires some smart planning. Research and understand which type of cruise you'll be taking. Is it adult oriented? More for couples? Or is it family oriented? And if it is family oriented, is it kid-friendly? Each cruise line focuses their ships on a different target audience, so you must weigh the pros and cons of each ship according to what you and your family expect to experience on the trip. See which family activities are available, the meal options, if there's childcare available, room sizes and of course, the price. It is common for cruises not to have a wide variety of activities for young children, unless it is a cruise designed specifically for kids or families with small children, like Disney Cruise Line, among others. This is why it is always good to check the full itinerary and list of activities available to make sure there are enough activities for everyone to enjoy. If you feel like planning a cruise trip for your family is too much of a hassle, ask a cruise travel agent to help you with that. They will make sure everything is booked and prepared just like you want it, and in some cases, they might even get you some extra perks only agents get. They'll take care of all the paperwork, so the process is seamless for you. And the best thing is that it won't cost you extra since their commission comes from the cruise company, not your pocket. Let them see brochures of the cruise ship, pictures of the pools and amenities, and discuss with them all the available activities. Remember, this is as much their vacation as it is yours, so make sure they will have a good time by allowing them to share their opinion about which cruise they feel they might like the most. Also, have in mind that traveling with your kids does not mean you need to be with them all the time. This is a good time for you to plan ahead some couples time, like a massage or dinner together while the kids enjoy an activity that has adult supervision or sitting by the crew. Traveling With Non-potty Trained Children? If you are, then you must think about it before hopping on this trip. While you will enjoy your cruise vacation whether your child is potty trained or not, it is often best to wait until they are potty trained to get the most out of your money and experience. Non-potty trained children are not allowed to swim in cruise ship pools, but, some cruise lines are offering splash areas with special filtration on select ships for diapered children. If you've cruised before with the same company you're considering at the moment, let them know about it. Some cruise lines offer a "past guest discount" for repeat customers. In some cases, they even add some extras like a past-guest party with free drinks among other perks! On the first day, almost everyone boards the ship at the same time, early in the afternoon, since they want to make the most of the ship. This means your bags may not get to your stateroom for hours after you arrive. If you want to start enjoying the ship immediately after boarding, pack in a carry-on bag your swimsuit, camera, shorts, and other items you feel you'll need for the first few hours on the ship. This way you can jump straight into that pool after checking in! If you're cruising with teenagers, it is very likely they will want to do some activities on their own. That is ok; they are making the most out of the experience. But before they go loose on the ship, print two copies of the itineraries and highlight with different colors each others activities (each will keep a copy). While doing activities on the ship, it is easy to lose track of time. To avoid searching the entire ship for your kid (or parent) to meet for dinner or an activity you're doing together, simply look at the highlighted itinerary to know where they'll be at any given moment. Alternatively, you can have a set of two-way radios, but be aware that cruises can be noisy, so it is possible they might not hear you calling sometimes. These days everyone carries a cell phone, tablet, or laptop everywhere they go including cruises. Some cabins offer only one pair of outlets, and sometimes these are placed in very inconvenient locations. Take a six-foot extension cord with multiple outlets with you, and voila, everyone is happy and charged! It is common to buy souvenirs in many of the port stops and even on the cruise itself, so having an extra bag will save you some headache later when trying to pack everything to go back home. 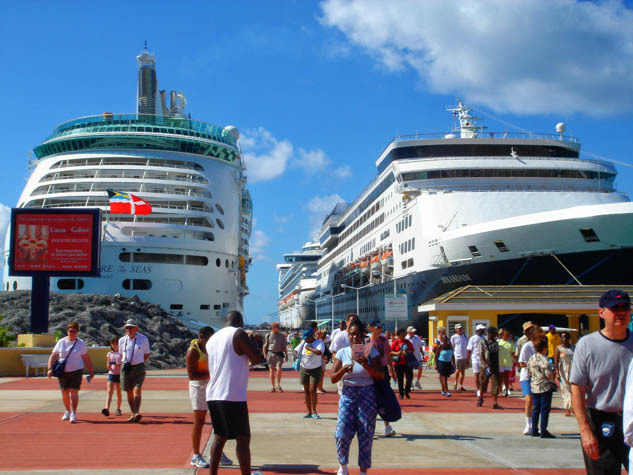 It is not uncommon for travelers to miss their cruise due to a delayed or canceled flight. The cruise will not wait for anyone, and if you missed it on that first day, you missed it altogether. So, make sure to give yourself some buffer time for any unexpected delay. If everything goes smoothly, at least, you have an extra day to sightsee the city before the ship leaves! Also be sure to take out the appropriate travel insurance plan just for cruises, including trip disruption insurance.